We planted purple eggplant in our garden this year. It was our first time, as a matter of fact. A friend of mine blessed me with 4 eggplant starts and I figured, “why not?”. The eggplants took over. Seriously. I had to learn how to preserve the rest for later. 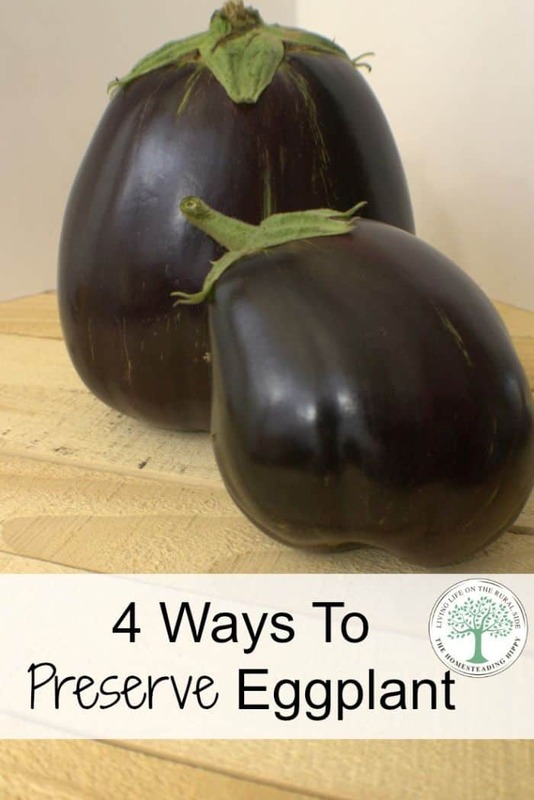 Did you know there are at least 4 ways to preserve eggplant? Really! Can eggplant be frozen for future use? ABSOLUTELY~and with no loss of flavor! It’s perfect for eggplant parmigiana, moussaka (get the recipe here) and even breading and frying later! Slice the eggplant into 1/4″ slices. Lightly salt to remove bitterness. Lay slices on a cookie sheet in a single layer. Flash freeze for 4-6 hours, and then place in ziploc bags. Flash freeze for 4-6 hours, then place in ziploc bags. *Will keep for 3-6 months. Peel and cut into 1 inch cubes. Lay in a single layer on a dehydrator sheet set at 200° for 12-24 hours. They can also be oven dehydrated at 200°. Store in an airtight jar, indefinitely. Use in soups or chili in place of meat or beans. Adds a great texture to meals when re-hydrated. Peel and slice eggplant into 1/4″ strips. Cover eggplant with salt and let it rest for 30 minutes, then rinse well. This will get ride of any bitterness. In a sauce pan, bring the vinegar and water to a boil. Add onions, peppers, garlic , dill, and eggplant. Simmer for 20 minutes, then drain the water. Fill jars with pickled eggplant mixture. Add one bay leaf to each jar and cover with olive oil. *Store for at least a week before using. Can you can eggplant? SURE! This uses the recipe from above to pickle and can the eggplant for pantry storage. The texture will be a bit mushier with this method, but the flavor is still great. It is perfect for salads, eating out of the jar as a snack, or on a relish tray. Combine the vinegar, water, and salt in a stockpot or large saucepan. Wash seven pint canning jars. Add one garlic clove, one dill head, and a bay leaf to each jar. Fill the remainder of the jar with sliced eggplant. Ladle the pickling solution into each jar, bringing the juice level to within 1/4 inch of the top. Place a lid on each jar, and secure with a canning ring. Bring the water to a full rolling boil in a water bath canner. Lower the filled jars into the canner using canning tongs. Allow the canner to return to a full rolling boil, and process the pickles for 15 minutes. Remove the jars from the canner using the tongs and set them on a counter or tabletop to cool. What are some of your favorite ways to preserve eggplant from your garden? Have you tried any of these methods? Be sure to pin this for later! I dehydrate everything. If I think I can, I do! Its one way that you can then rehydrate and just about use in anything just for the flavor. Have ever tried to fry rehydrated eggplant? How did it go? I am the only one in my family that likes eggplant, and i really only like it fried..